My personal blog, news and Instagram-feed – all that happens in one place. A fantastic winter season is over. I stored my skis a week ago although there is still great skiing to find up on higher altitudes. Granath Mountain Guiding need some rest. Since beginning of December I have been guiding more than 110 days on skis all over the alps and the North of Sweden. The winter in the alps started slow with not very much snow, warm temperatures and thin snow cover. Many resorts in the alps didn’t have any snow at all! In Engelberg it was not that bad. We had cold snow down to 2400m and the ski-touring from Titlis offered beautiful spring conditions. Even though the conditions was not optimal I guided Titlis rundtour twice and Reissend Nollen twice during December – more timed than I guided this tours the year before! In January the conditions went better and we had some powder skiing in. Locals in the valley still complained about the skiing conditions. I didn’t. I ended January with five days of skiing in St.Anton on Skiers Accredited “winter meeting”. Beginning of February I went working two days in Davos. Ski-touring on beautiful Pischahorn in perfect weather and snow conditions. The week after that I had some productive photo-shoot days for Elevenate together with Olle Regner master photographer Mattias Fredriksson in Engelberg and Airolo. The month continued with private guiding around Engelberg. I visited both Bannalp and Brisen a couple of times for great ski-touring. I started April with a ski-touring week in my backyard. 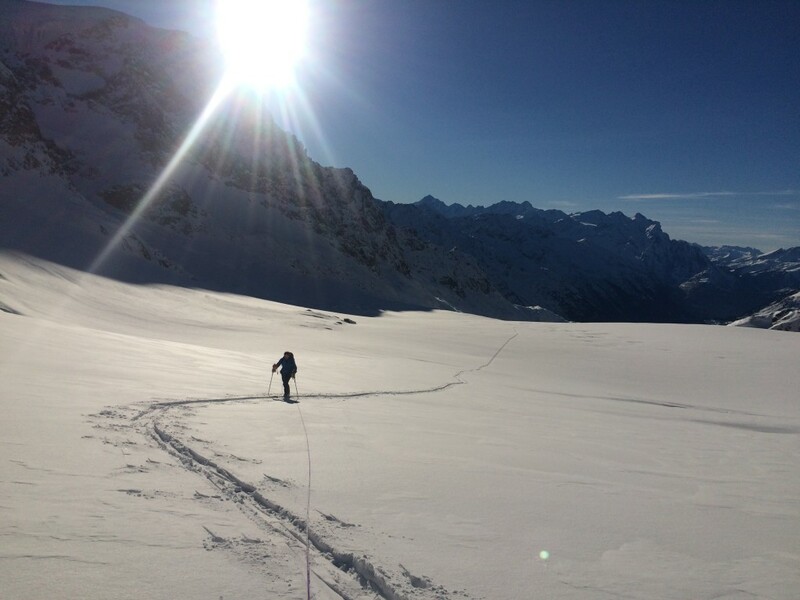 Urner Haute Route, the fantastic five day ski-tour between Andermatt and Engelberg aka the skiers Haute Houte. I continued with hut-to-hut ski touring throughout April. I had a successful week in Zermatt and Monterosa, together with Jörgen, Niklas and Johan we climbed and skied 8 4000m peaks! 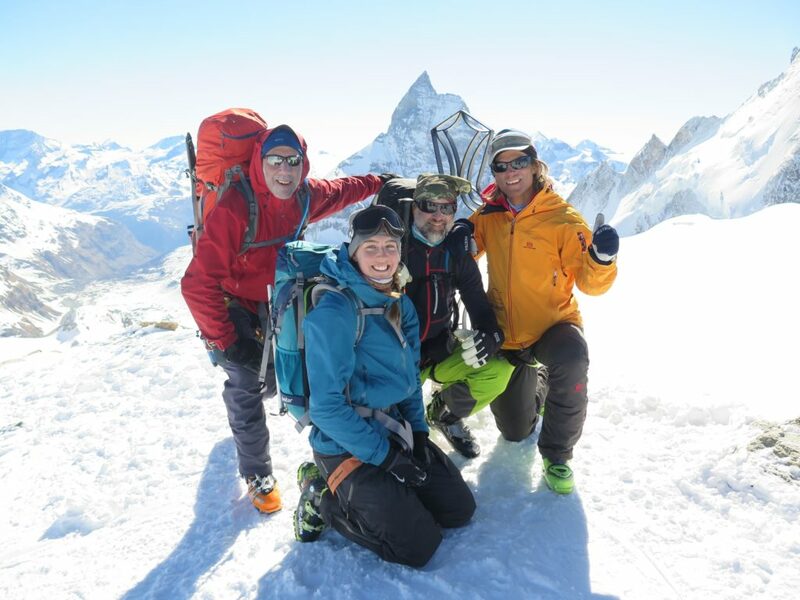 A week later I did another great classic – the Haute Route between Chamonix and Zermatt together with Per and Peter and friends from Calgary, Joel and Sarah. The week was extra-ordinary. Demanding conditions the first days and then… everything you want – beautiful weather and great snow conditions. In the beginning of May I flew up to the North of Riksgränsen for ski-touring and Heli-skiing. Love the North and I hope to be back next spring again. I ended up the season with one week of high altitude ski-mountaineering as it should be in the month of May. Three 4000m peaks, Mönch, Strahlhorn and Rimpfischhorn with best company, Jimmy Weman. I want to thank all my clients for a fantastic ski season! Have a great summer! Conditions for the Engelberg ski-mountaineering classic Titlis rundtour, have been really good last three weeks. Great weather, nice fluffy snow conditions on altitude and sufficient snow cover all the way down to the valley combined with low avalanche risk, who can ask for more? This alpine route around Titlis has all components to make a great day out in the mountains. Little bit of climbing on an airy ridge, steep skiing, rappelling, skinning and glacier travel, great views and a 1600m north facing ski descent back down to Engelberg valley. Titlis rundtour is very easy accessible from Engelberg with help from the new Xpress gondola and Titlis rotair and can be done in a day by taking the first lift from Titlis talstation. From summit of Klein Titlis 3062m the route goes down the Steinberg gletscher to around 2700m where you make a lefthand traverse above band of rocks(exposed) to Hinters Titlisjoch 2695. From here you have to hike/climb 10min on an airy ridge to Vorderes Titlisjoch. This ridge is exposed and its wise to use appropriate equipment for this passage; ice-axe, rope and crampons. At Vorderes Titlisjoch you rappel down the South side to Chli Gletscherli. With a 50m rope you will be able to rappel down where the couloir widens up. Its also possible to ski in to the couloir from the top without rappel. After a short descent you reach a steep chute “Schwarzen Naad”. On the right side of this chute you find several anchor points. With good snow cover its possible to ski this chute(40-45°), the last 50m however, its usually done with help of rope. After this steep chute you ski down a gentle slope down to 2100m where you put on skins. The first section on the climb up is steep(ski-crampons useful), when you arrive on the Wendengletscher the skinning is easy up to Bivak am Grassen 2647m. You have now time to fully enjoy the amazing backcountry terrain and views of the “other side” of Titlis. After a sunny lunch break at the Bivak you ski down the North side back to Engelbergtal. The ski-descent area East of Titlis is huge and there’re many variations down to Fürenalp. This shady side of Titlis give you a fantastic run of 1600m vertical meters, often in powder snow. Snow conditions will decide which way you choose down. However, the standard exit will pass the bridge at P.1165m and follow the summer path down to Herrenrüti. From here you ski the cross country trail to the Fürenalpbahn and the bus station. The skiing down the South side from Vorderes Titlisjoch is challenging when the snow is hard and icy. Appropriate equipment is therefor a must; rope, ice-axe, crampons. The first part of the skinning from Schwarzer berg(2100m) is steep(ski-crampons useful). Good kick-turn technique is required. Timing on Titlis rundtour is crucial. Rappels on the South side takes time. The skiing down from Bivak am Grassen to Fürenalp involves complex route-finding and avalanche prone slopes. Navigation & avalanche knowledge is obligatory. Time: Klein Titlis – Schwarzer berg 2h30min, Schwarzer berg – Bivak am Grassen 2h(+550m). Bivak am Grassen – Fürenalp 1h(-1600m). Equipment: 2x50m rope can be useful. In good conditions one 50m rope is enough. Glacier equipment and Mountaineering equipment(ice-axe, crampons, harness etc). For who is Titlis rundtour? For those who like backcountry skiing and want to try real ski-mountaineering. Titlis rundtour is a perfect introduction to steep skiing and different mountaineering techniques. More alpine and challenging than any run of the “big five”. A future Titlis classic for sure. Yesterday me and my friend Robert Lönnell took advantage of the amazing autumn weather and went to Grindelwald for a quick ascent up to 4107m high Mönch by the North/West Nollen route. The drive by car to Grindelwald and the Bernese Oberland 4000m peaks is less than two hours from Engelberg. This neighbor massif is home of nine 4000m peaks including Mönch and Jungfrau. Also, not to forget, the famous Eiger Nordwand. We arrived at Grindelwald at 14.30 o’clock in the afternoon and took the train up to Kleine Scheidegg at 2061m. From Kleine Scheidegg you can enjoy the view over the Eiger, Mönch and Junfrau North faces. Amazing! Without stress we arrived to the Guggihütte at 17.00 after a nice +900m walk. From the hut the views and evening sunset is breathtaking. The Guggihütte is not manned in off-season but it has a open fully equipped winter room. The Nollen Route is an ice/snow super classic. The route takes a straight and evident line up the North/West face of Mönch. From the hut you climb easy rocky ground, zig-zaging and following cairns up to Mönchplateau, 3110m. From there, you continue straight up the snow slopes until you arrive to the foot of Nollen passage. The overall alpine grade is D with ice passage of 60°-70 degrees. From summit the descent the by the South ridge is knife-sharp. The ridge and some easy rock down-climbing makes the roundtrip varied and complete. We used 6 ice-screws, 4 quick-draws and 50m rope. It took us 3h45min from Guggihütte to summit. 2hours from summit down to Jungfraujoch. 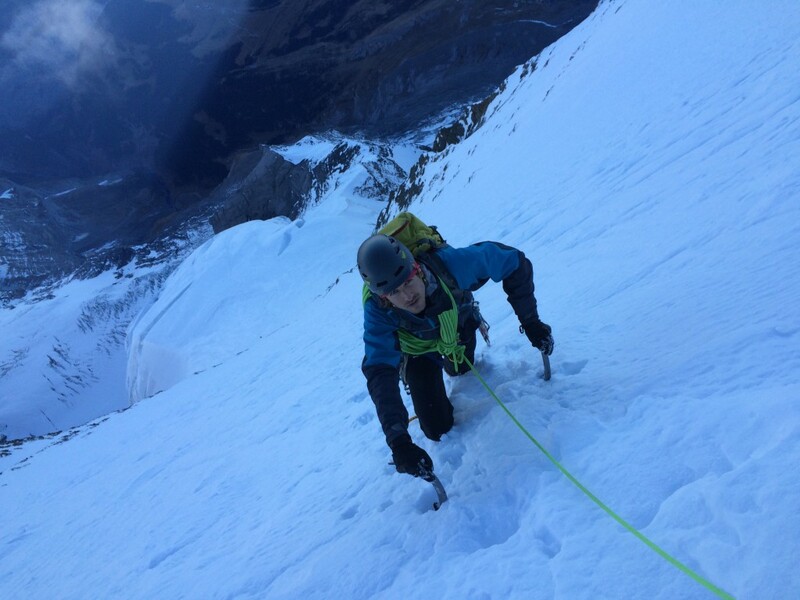 Nollen is a perfect route for climbers who looks for develop their snow and ice-climbing skills and in meanwhile climb a classic beautiful 4000m peak. Mönch can be combined with ascent of Jungfrau, 4158m and Eiger, 3970m by staying in Mönchjoch hütte and Mittellegi hütte. Nollen can be climbed from early spring to late autumn. In spring it can also be a project for motivated ski-mountaineers who looks for steep glaciated skiing. I can really recommend the route in autumn as we did it. Calm, not much people and perfect conditions and temperatures. October and November is a perfect time for mountain climbs like this. Browse through the best of my old blog archive here.